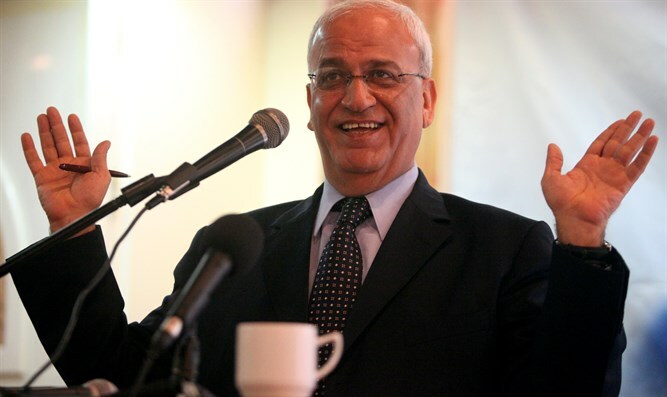 Saeb Erekat tells UN 'Hamas, PFLP are not terrorist organizations,' says key to stopping ISIS is defeating Israel. Israel's Ambassador to the UN Danny Danon responded, saying, "They have no shame. These are lies and incitement from those who are paying terrorists to kill innocent Israelis. These obsessive attempts to besmirch our good name will not change the fact that the Palestinian leadership refuses to end their support for terror." During an earlier briefing at the UN, Ambassador Danon displayed a photograph of 23-year-old Israeli Border Police officer Hadas Malka who was killed in a terror attack earlier this month. Ambassador Danon explained that one of the groups presenting at the UN forum today works with the PFLP terror organization which claimed responsibility for Malka's murder.